Is it a shame that in spite of being a Bengali I have shared so less non-vegetarian dishes on my page? I never realized this fact till Hubby pointed it out today. Actually I don’t enjoy eating non veg much and Hubby also likes to eat them occasionally. But now a days both of us are trying to make it a regular habit as our soon to be one year old loves eating fish. Jokingly we always say that he has acquired this habit from his Mamabari (maternal uncle’s place) as my side of the family can survive on non vegetarian dishes only. They are so fond of fish and meat that if these are served to them for all four meals a day they won’t complain. Because of the geographical location of Bengal and all the rivers surrounding it, Benaglis primarily prefer fresh or sweet water fishes. Most of our favourite fishes including carp varieties like rohu, Katla, koi or climbing perch, the small varieties from catfish family like tangra, magur, shingi, or verieties of prawns or chingŗi like Kucho or very small shrimps, Bagda or Tiger prawns and Galda or Scampi come either from rivers or are cultivated in ponds. Apart from these well known varieties small fishes like Bata, Khayra, Pabda, Punti or Mourala are among favourites. In Bangalore these special Bengali varieteies are not very easily available. Though some shops are directly getting them flied from Kolkata but those are not very fresh for which I prefer to bring some whenever am flying down from home. Most of the fishes that are sold in Bangalore come from faraway places like Mangalore, Pondicherry, Kerala or Andhra Pradesh and a large amount of these are salt water or sea fish. Khayra is a small fish and smells and tastes exactly like Hilsa, They even look like smaller version of Hilsa. The only drawback is it has a plenty of small bones. Back home these were Hubby’s favourite and never thought we would get them here. Last year when my parents were here one day in the afternoon we saw a thelawala (cartpuller) selling some small fishes. We were working at the garden then and just out of curiosity went to check the content. The seller told they were Matti fish but Maa exclaimed Khayra Machh (khayra fish) and we eagerly bought some. Maa made a spicy whole fish fry with them and everyone devoured them with great pleasure. Ever since then these fishes are regular in my kitchen and now we buy them from our local shop. In Bangalore they are known as Matti and are sold at a throw away price of Rs. 40-50 per KG. The recipe that am going o share today is a macher Jhal recipe. Jhal in Bengali literally means Hot and being true to its name this dish is fiery hot with lots of green chillies so this HOT HOT dish definitely not for faint hearted. This is a semi gravy dish with Mustard paste and onion as the base and slited green chilies and nigella seeds as flavoring spices. The fishes are fried till light brown and all its parts are edible that way. Jhalmach as they are well known in Bengal is a hit at my home and any small fish or rohu/katla steaks could be cooked this way. Best enjoyed with hot steamed rice. if you want the flavor of fresh green chillies sans the heat then deseed them. Mustard Oil: 5 tbsp; and ½ tsp for pouring later. I prefer to cook all mustard paste based dishes with this oil as this intensifies the flavor and taste. If you prefer to use any other oil then my submission would be to mix at least 1 tbsp of mustard oil to that. I prefer to cook this dish in non stick pan. In normal pan you might need to use more oil. It’s better to cook the dish in a wide pan. Wash the fishes and smear salt and turmeric. Heat the oil and fry the fishes till lightly crisp on both the sides. Keep aside. While the fishes are frying peel the potato and cut in thin slices. Keep aside. Now in the same oil add the green chillies and nigella seeds. (Be careful at this stage as chillies in hot oil will result in a lot of spluttering.) Once they splutter put the sliced potatoes in and fry them on low heat till soft. Add in the onion paste and fry till oil separates at sides. Tip in the chopped tomatoes, salt, turmeric and chilli powder if using. Again fry on low heat till the tomatoes are mushy and fat separates. Now put in the mustard paste and fry for a minute and quickly add 11/2 cups of water. Check the seasoning and let it come to a boil and then add the fishes one by one. Don’t put the fishes on top of each other but place them side by side. Cover and let it simmer on low heat for 4-5 minutes then turn the side and again let cook till the gravy thickens. Once the potatoes are cooked pour in the ½ tsp mustard oil and serve hot with steamed white rice. 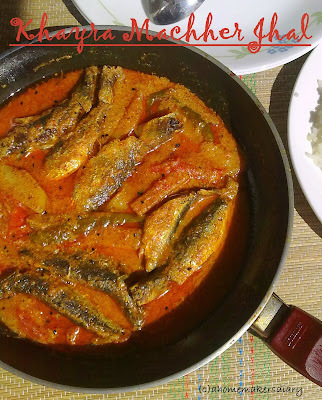 Gouridi of Didibhai's Kitchen have recently posted a similar small fish curry. check it out here. I have been showered with some more awards by Ann of Split-pearsionality and the chef duo from Adukalavishesham. Am truly honored and touched that you all remembered me. already I have written 7 secrets about me HERE. will share it with some of my blogger friends in my next post. Delicious may not describe it, looks so good.I am heading out to buy some small fish as soon as humanly possible and try this out. I have to admit that i never had khayra mach:-( I regret it now exp. seeing this picture of yours. I used to be very picky about fish back home and i skipped eating some fishes. This is the right time to catch the kids to put them on high protien diet, particularly fish and red meat and lot of milk product. Kotha theke kinle janio to, Bangalore gele rendhe boudi der kha-oabo ( dui dada ar didi blore thaken. Yummy fish curry! An award waiting for u. First a big thank you for mentioning my recipe of 'bata mach sorse diya' here on your blog. Jano bohu deen holo kahyra mach khaeeni. Tomar macher jhalda darun dekte hoeche. Tobe ekhon ami aae typical bangali jhaata dekhe anando nilam. Jakhon ranna korbo jani garam bhaater sathe khoob bhalo lagbe. Thats a fantastic dish, tempting fish gravy!! 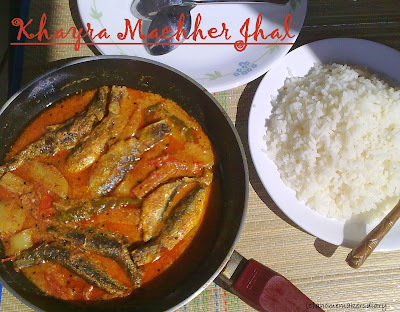 Khayra Macher Jhal looks absolutely delicious! Oh My!!! oh My!!! terrific.. Your Khayra fish looks so delicious.. Khete khub echhe korche..Don't know if it's available in BLR. If yes,Will try it out very soon. Fish curry looks very colourful and tasty!! I come from seaside and fish is in our daily diet! U make me nostalgic with this fish curry! I adore small fish gravy , they re tastier! I lived in cal for a couple of years, but somehow, never developed a taste for river fish! This gravy however looks absolutely delicious! I so much prefer fish to meat any day. (Although I like veg best of all!). This dish looks like it's stuffed with flavor. Just the way I like it. loooove it..its always a case of spicier the better in my book! Fish looks like sardine..mathi is malayalam name for sardine.. is it the same fish ? Looks like it in the pic. Wow, at 40-50 per kilo is really a good price. In my area they sell for 90 per kilo. 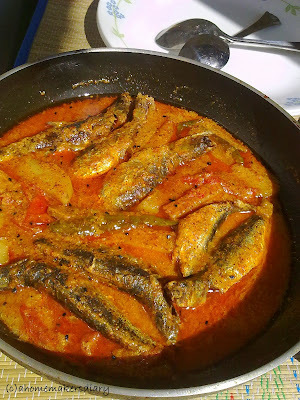 I love this fish and should try the bengali way of making it. Looks spicy and yum ! That is one stunning fish curry - almost makes me want to go out and buy some fish and make it. Not sure about the particular fish you have mentioned, will check in the huge Bing fish market near my house.Thanks! Delicious! I am dying to eat some fish curry. 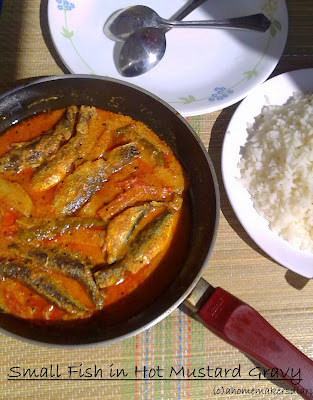 @ISG,PJ, Soma, Sharmila, you can make this curry with any fish small or big. just fry them little bit more to get a light crispy coating on them. pravs scrap that this could be sardine as well. need to check. @Gouridi, dont thanks me you deserve much more than that. @Sharmila, I really meant that and once that post was scraped I realised I had more to say. though I havnt mate you but i have a strong feeling that you are a very warm and friendly person. Love your blog. @Pravs, thanks for the info. it could be Sardine as well. will ask the shop owner next time am there. @Gulmohar, try it with sardines. it seems the same fish. @Mayuri, Welcome. guess this could be sardine also. would await your recipe asap. good to see so many appreciations for the fish recipe..iam a vegetarian..so i wuld suggest this to husband .he wuld luv to try this.. Yes, this is Mathi/Sardine; beautiful snapshots! What do you come up with wind up to it ? It looks really delicious!! Love your fish curry recipes. They are so different from ours. We usually do not add vegetables to fish curry. I would definitely try this one. Following you..
What is a mustard paste and how do you make it? @Anonymous, mustard paste is the wet paste of mustard seeds. to make this grind mustard seeds (any variety like white or black mustard seeds)with little bit of water in a mixer-grinder or coffee grinder till smooth. it should not be runny but thick. once the paste is ready take required amount and mix with little bit of water and make a liquid paste and use as stated in the dish. for any further query please feel free to contact me. Looks very delicious.. Will have to try this sometime. You might also like to look at this link, which is my mom-in-laws version of Macher Jhal..
in legit work from home jobs for moms, I suggest that you read this article in its entirety. But the problem with pay per click is something that requires trial and error to find out which keywords will convert into sales. Stay focused, and try not to fall for any of the above. than legal, quick ways to make money, please reconsider. company, tune it down, and find the offer that makes sense to you.